The Comfort Heatingplate Plastic Cover is suitable for the Comfort Heatingplate WP-25 (25cm x 25cm heating plate). This cover plate has a sloping top design to prevents chicks sitting on top of the brooder and making a mess. 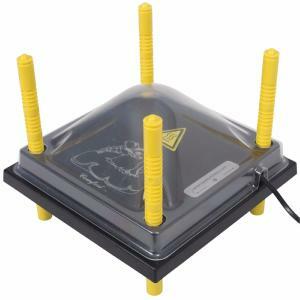 Manufactured from clear plastic, this cover simply fits over the top of the Comfort Heatingplate WP-25. Simply remove and clean with warm water after every use. THE COMFORT HEATPLATE IS NOT INCLUDED.